Students in the Digital Media Management program study digital communication and contribute to the conversation, both in business and entertainment. They learn how to manage various forms of digital media, including music, television, movies and games, and explore the business world’s adoption of digital. In addition to core business areas, such as accounting, marketing, economics and management, students delve into digital marketing, project management and social networking. The information sector, which includes media, research and development, computer systems, telecommunications and advertising, accounts for more than one-third of the U.S. GDP. A central trend in this sector is the merging of media, communication and entertainment. Almost half of all new capital investment in the U.S. is devoted to IT. Austin’s gaming industry represents the most dynamic digital media business growth in Texas. Major Requirements: The Bachelor of Business Administration (BBA) in Digital Media Management requires 66-67 hours of major coursework. General Education Requirements: The Digital Media Management degree requires 44 hours of general education requirements that students complete over four years in addition to their major courses and electives. View and download the full degree plan for our Digital Media Management major (PDF). Social Media Marketing – Learn to apply social networking for personal and corporate branding, and gain the analytical skills you need to manage and measure social marketing efforts. Digital Interactive Technology – How is digital content created and delivered? Gain hands-on experience developing a website with publishing software, server technologies and transaction systems. Digital Marketing and Analytics – Apply digital marketing concepts to analyze an organization’s online presence – through a customer’s eyes – and analyze the effects of creating this online identity. Are you seeking a digital marketing emphasis? Learn about our Digital Marketing minor below! Our distinguished faculty members are scholar-practitioners with years of industry experience and strong, creative passion. They work side-by-side with business professionals on digital media projects, providing real-world expertise that enriches classroom learning. "I know how important it is for students to go through their college life and learn the real-life skills and knowledge that they can use when they graduate and start their careers. This is what I craved as an undergraduate! The Digital Media Management major ensures that students have an in-depth understanding of the theory, but most importantly, they have the opportunity to apply that understanding to real-life scenarios to fully prepare them for life after college." Our location in Austin, Texas, a booming tech hub, puts Digital Media Management students in the perfect position to interact with business leaders in the tech or startup industries. The Bill Munday School of Business offers a roster of local partnerships where students can get their foot in the door and gain hands-on experience in the field – Austin Inno, Austin Technology Council and Women Who Code, to name a few. South by Southwest (SXSW), a tech conference and festival, brings innovation and industry leaders to Austin each March. Students can volunteer or attend and gain access to global thought leadership in their industry. Each year, several Digital Media Management students attend conferences to present their research findings and network with digital professionals. Some have even received funding to attend conferences through Marketing EDGE. The Digital Media Management degree program is designed to create a new type of manager who can navigate and collaborate across fields of expertise, including the digital arts, technology and business. Our alumni have gone on to work for Facebook, NBCUniversal Media, Disney, GSD&M and On Vinyl Media. When Brianna Chacon '16 needed to seek out a career mentor for a class project, she set her sights high. After sending over sixty messages and connection requests on LinkedIn, she landed an informational interview with the VP of Entertainment Marketing at ABC. 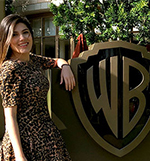 One thing led to another, and Brianna gained direct experience in the entertainment business with internships at Disney ABC Television Group and Warner Bros. Pictures. Now, she’s a digital coordinator for NBCUniversal Media, LLC. Read about our successful alumni. See what they have to say about life after St. Edward's. Any student at St. Edward's University may minor in Digital Marketing. The minor allows students to be well-prepared for roles requiring digital marketing expertise. A Presidential Award winner, Dominick Namis ’17 spent a summer interning for Mozilla in San Francisco and has been heavily involved in the Student Government Association, Campus Ministry and Service Break Experiences. After graduating, he will start full-time as an account manager at Facebook.